This is perfect for one of those busy weeknights where you have little time to prepare a delicious meal. This doesn’t require a lot of ingredients and can be completed in time you’re done cooking the pasta. Cook pasta according to the package instructions. Drain. Reserve 1/2 cup of pasta cooking water. While the pasta is cooking, you can heat olive oil and ripped up prosciutto pieces. Cook until it becomes crispy. Remove with tongs to a plate. Add garlic and cook for 30 seconds. Add spinach, salt, pepper and lemon zest. Cook until spinach is wilted. Mix pasta with spinach mixture and reserved pasta water. Add grated Parmesan cheese. Mix well. Serve pasta with pieces of prosciutto on top. We love this recipe! This is not only cheap but very affordable to make. You know I love those Instant Pot meals because it means less things to wash! Click on sauté on your Instant Pot. Put the ground beef, diced onions and minced garlic on. Sauté until the ground beef is browned. Drain the fat from the ground beef. Add tomato sauce, diced tomatoes, Italian seasoning, soy sauce, water, pasta and some salt and pepper to the Instant Pot. Stir well. Place 3 bay leaves on top. Close the lid. Make sure the valve is sent to sealing. Set it to 4 minutes manual high pressure. When time is up, (the Instant Pot will say L0:00 and start counting up), you can switch the valve from sealing to venting for quick release. Open the lid, give everything a good stir and remove the bay leaves. You can serve them with some shredded cheese on top if desired or grated Parmesan. This is a great meatless dinner to make. Simple and yet packed with flavor! Goes great with a glass of chilled rosé. Combine tomatoes, vinegar, garlic and salt in a large bowl. Set aside to marinate. When the pasta is done cooking, reserve 1/2 cup of pasta water then drain. Return pasta to the pot and add in the 1/2 cup pasta water and the fontina cheese. Stir until cheese is melted. Then add in ricotta. Mix well and move to a serving bowl or individual pasta bowls. Use a slotted spoon, spoon the marinated tomatoes over the pasta (discard the marinating liquid). Drizzle with oil and top off with basil and ground black pepper. I love this recipe because it’s a time saver. Traditional Bolognese sauce takes HOURS to make on the stove but with the Instant Pot, it’s ready under a hour. It’s also my understanding that traditionally Bolognese Sauce is made with half beef and half pork. Feel free to substitute with whatever you feel like using or going with one type than using both. For this recipe, I used ground beef and ground pork. Whenever I make this, we use half of the sauce for dinner then freeze rest in pints. They freeze well for future use. Select Sauté setting on the Instant Pot and heat the olive oil. Add in onion, garlic, celery, carrot, and salt and sauté for approximately 5 minutes or until the onion has softened and is translucent. Add in ground beef and ground pork. Break it all up with a spoon. Cook it for approximately 10 minutes or until cooked through and no traces of pink remain. Add in tomatoes and their liquid. Crush the tomatoes with your hands as you add them to the Instant Pot. Stir in the red wine, tomato paste, bay leaves and ground black pepper. Secure the lid. Select Meat/Stew setting and set it for 35 minutes at high pressure. Make sure your valve is set to sealing. When the timer goes off, you have two choices. You can either switch the valve to venting or you can leave it on sealing and let it pressure release naturally. I serve it over pasta and sprinkle with freshly grated Parmesan cheese. In my house, anything stuffed with cheese is a hit. I’m a major “cheeseaholic” who could probably never live without cheese. What’s great about this recipe is that it is very easy to make! You could also substitute one cheese type for another. Mix all the ingredients from the Meatloaf Mix list. Mix well. Divide this mix into two pieces. You will need either a round baking dish or a 8″ square baking dish pan. Spray this with some olive oil. Place 1/2 of the meatloaf mix in the pan and flatten it out. Add the three different types of cheese. Make sure you leave at least 1″ border around the dish so the cheese doesn’t ooze out that much when it’s in the oven. Sprinkle the sliced scallions on top of the cheese. Then add the other half of the meatloaf mix on top. Make sure this top layer covers EVERYTHING (cover the cheese, scallions, et cetera). Bake in the 350 degrees oven for 50 minutes. 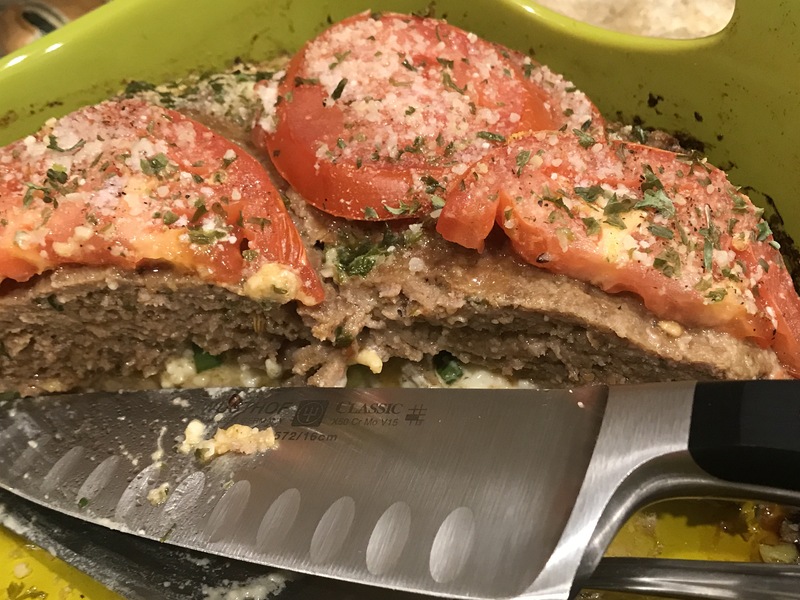 Add sliced tomatoes on top of meatloaf after it’s out of the oven. 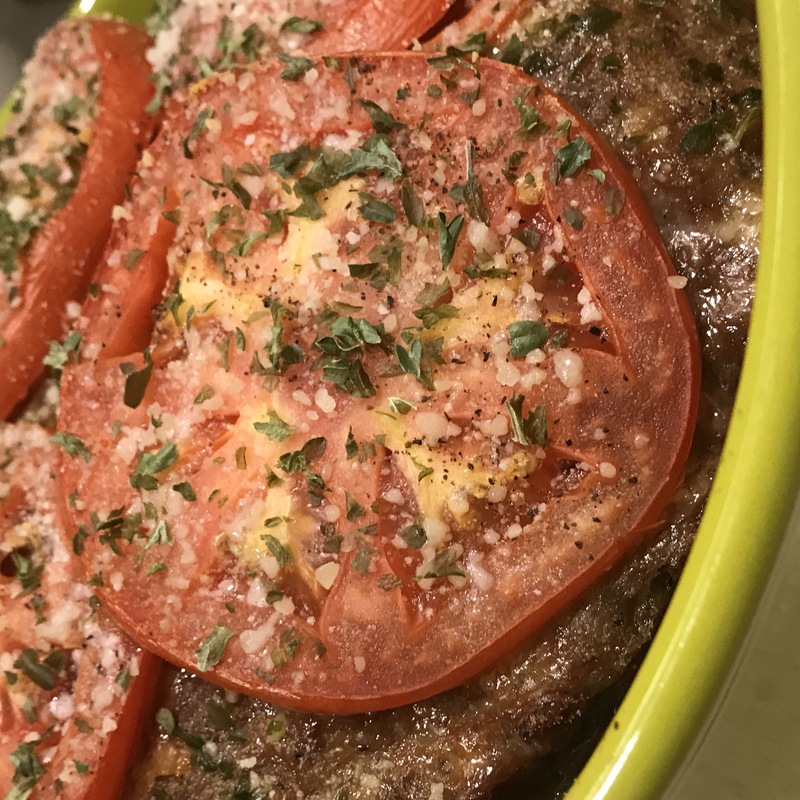 Sprinkle some ground black pepper and parmesan cheese on top of tomatoes and bake again for another 10 minutes.